A pair of Central Texas football legends are teaming with D1 Sports Holdings, LLC., and Elite Sports Waco to open a sports training and therapy facility in Waco. 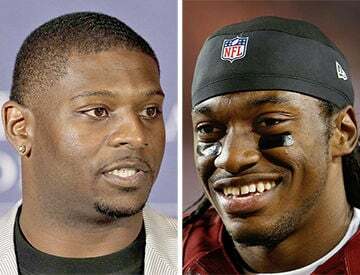 Robert Griffin III and LaDainian Tomlinson will co-own the business, which is scheduled to open March 16 at 5100 Franklin Ave.
Griffin will host a private training event March 12 at the D1 facility. To sign up for a spot, visit D1Waco.com. D1’s mission is to make athletes faster, stronger, more agile and explosive while also building character. Its adult programs are available for any gender and fitness level with programs for weight loss, general health, strength and endurance. The facility will have an indoor turf field and college-style weight room to go with a state-of-the-art sports therapy clinic. This will be the 26th D1 operation. Other co-owners include Peyton Manning, Philip Rivers, Tim Tebow, Chipper Jones, Carmelo Anthony, Herschel Walker and Jason Witten. Griffin led Copperas Cove High School to two state championship games before becoming the first Baylor Bear to win the Heisman Trophy in 2011. The quarterback was the No. 2 pick in the NFL Draft and won the offensive rookie of the year award the next season with the Washington Redskins. Tomlinson set the Central Texas rushing record, since broken by Midway’s John Hubert, as a senior at University High School. He then went onto a TCU, where he won the Doak Walker Award as the nation’s best running back, then went on to an 11-year NFL career with the San Diego Chargers and New York Jets in which he rushed for 13,684 yards and 145 touchdowns and won the MVP award in 2006.